Better compression of gas for storage, cooling solutions for data centers or buildings, air purification, faster wound healing for patients… there are so many uses for nano-porous materials (MOFs) to meet future challenges in health and energy. In 2018, the partners of a European project developed two processes for the synthesis of MOFs at the pre-industrial scale and at a competitive cost making these applications possible. 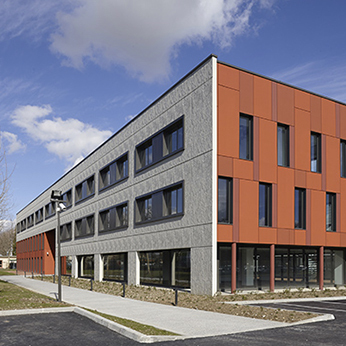 Located at the heart of the campus of LyonTech-La Doua, the new Axel’One campus site is the essential upstream link of the research-transfer-industry network. Built on 2,000 m², it was designed for small-scale experimentation and the sharing of research tools. As soon as it opens, it will host over 40 collaborative research projects from metropolitan academic laboratories in the fields of innovative processes and materials. The chemistry and the environment of the future will be developed on the Axel’One Campus. On January 31, 2018, the General Assembly of the chemical-environment Axel’One Platform opened up the association’s governance to new members to be in line with its new roadmap. Two new industrial members (Adisseo and Elkem Silicones), already part of the platform, have joined the Board of Directors and the Axel’One office. The company NEOLIFE, the start-up – Odice Innovation and the Canadian start-up – Exigence Technologies along with its subsidiary Exigence Technologies France, all three working in the field of innovative materials, joined the Chemistry-environment collaborative platform – Axel’One, to boost their innovation and develop new product lines. The Axel’One Collaborative innovation platform benefits from funding of 1.8 million euros over 4 years through the Future Investment Program (PIA) – Industrial projects for the Future (PIAVE), a program piloted by the Commissariat General in Investment (CGI) and operated by Bpifrance, to launch the industrial analysis platform, Axel’One Analysis, in partnership with a consortium of 7 industrial partners. With 6 dedicated team members and more than one million euros of online analysis tools that are already operational, the platform, initiated by IDEEL as a result of the innovative collaborative project, pools together skills and tools for R&D projects. It provides a perfect interface between suppliers of instrumentation and measuring devices, industrial users of these new technologies and academic laboratories.